*There may be some minor spoilers included in this review. 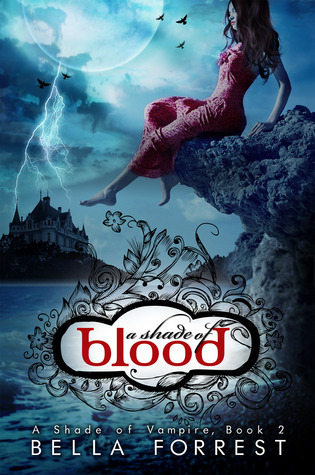 When Bella asked me to review her second book, A Shade of Blood, I jumped at the offer, even though I promised myself earlier that I wouldn't accept any more review requests until I got caught up on my ever growing pile of schoolwork. What can I say? I have a weak will when it comes to books. xD Although I wasn't completely mind blown by A Shade of Vampire, I found the premise to be pretty unique compared to your usual vampire lore. If I ever saw that cover in a store, I wouldn't be able to resist buying it, or at the very least, picking it up and reading the synopsis. I love every single thing about it, especially the elegant design surrounding the title. The contrasting shades of blue and the lightning bolt striking the island gives the novel a sort of ominous and haunting feel. Even though the previous cover theme wasn't horrible to look at, it was nothing compared to what it is now. To be honest, these covers look more professional than those created by big publishing companies. In the first book, I felt that things, especially the relationship between Sofia and Derek, progressed just a little too fast to be considered believable. However, since the novel only spanned about 149 pages, I understood why important events had to be rushed a little quicker than usual. Prior to reading A Shade of Blood, I was hoping for more background information on how the mysterious island the vampires labeled "The Shade" came to be. As well as a stronger foundation and much needed development for the seemingly instant connection the main characters had when they first met. In A Shade Of Vampire, Sofia was portrayed to be compassionate, loving, and entirely dependent on her best friend/life long crush, Ben. She did whatever he asked her to do, no questions asked, and followed him everywhere he went. However, even though she answered to Ben's every beck and call, despite the fact that he treated her like garbage and took advantage of her more often than not, you could see that she had that inner spark of strength, that once kindled, could grow into something extraordinary. I was pleasantly surprised to see so much character development! Her time at the Shade made her stronger and braver, because not only did she have to find a way to survive on an island chock full of bloodthirsty vampires, but she also had to somehow look after the innocent human girls around her, who just happened to be at the wrong place at the wrong time. When she arrived back home with Ben in tow, she didn't put up with his BS any longer, much to Ben's dismay. However, although I did enjoy watching Sofia change for the better, there were still some things I was a bit skeptical about. Bella painted Sofia out to be this kind hearted Samaritan, yet when she saw one of her friends about to get raped right in front of her, she decided to ignore the issue and deal with it later. This novel, or this whole series so far I should say, focused on the romance, with a bit of action mixed in now and then. To me, I would choose a seat gripping action novel over a tear jerking love story any day. But hey, that's just my opinion. I was never bored with the story line, but at the same time, I wasn't just dying to know what happened next. Interesting, but not riveting. I skimmed a few pages now and then, but that only happened once or twice. I enjoyed reading up on the history of The Shade, and was happy that many of the questions I asked myself in Book One, were answered fully throughout this novel. There were two love interests, but you couldn't label it a love triangle, because it was obvious who she was going to pick from the very start. Ben annoyed me almost every time he uttered a word, mostly because he took Sofia for granted and only made a move on her, because he felt like he was losing her to Derek. He always referred to Sofia as his. As if she belonged solely to him, like some high tech toy whose only purpose was to entertain him. There were times when I saw that glimpse of goodness within him, but overall, I didn't really like him. With Sofia absent, Derek veered closer towards his vampiric nature and came close to losing himself to the darkness festering within him. In fact, he did let go of his humanity once, and I was a little disappointed when Sofia brought the good out of him as soon as she arrived on the scene. That may sound kind of mean, but all the characters made such a big fuss about him losing himself to the darkness. I guess I was just expecting for it to take a lot more effort on Sofia's part to bring him back to the light. However, I did enjoy how much their relationship developed! Instead of being blinded by their affection for one another, they both had their doubts and their fears just like any other normal person would. However, out of all of the improvements in this novel, I would have to say that the most impressive of them all was Bella's dramatic change in writing style. Not saying that I thought her writing style was bad in A Shade of Vampire, in fact, it was great, especially for a self published author. But the way Bella strung sentences seamlessly together in A Shade of Blood was simply magical. Her novel was completely devoid of stilted, awkward sentences. Onto the dislikes. I'm not sure if it's only because I'm reading out of a draft copy or if it's like that in all the Ebooks, but the sentences were off every couple of pages. Letters and words were jumbled together, and I had a hard time figuring out what the sentence was really trying to say. Usually, I don't have a problem with spelling errors, but these were major and detracted from my overall enjoyment of an otherwise great novel. Overall, I was pleasantly surprised by how A Shade of Blood turned out. The first book in the series had tremendous potential, and Bella exceeded all of my expectations in the second. The relationship between Derek and Sofia developed a lot and didn't feel rushed or unrealistic like it was in the first installment. If your a fan of all things paranormal and are looking for a romance driven read, be sure to check out this series as soon as possible! This seems like a great book :) Thanks for following. Please know that I am now following and will become a regular visitor to your blog and also comment regularly. I love your blog!! !